Auriculotherapy, or auricular therapy, or ear acupuncture, or auriculoacupuncture is a form of alternative medicine based on the idea that the ear is a microsystem of the entire body represented on the auricle, the outer portion of the ear. Ailments of the entire body are assumed to be treatable by stimulation of the surface of the ear exclusively. Similar mappings are used in reflexology and iridology. 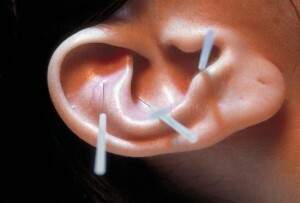 Auricular acupuncture writers often claim that the method goes back to early Chinese sources, although there are only a few references in Chinese medicine texts that make that reference plausible. The main claims are that the Han Dynasty book Huangdi Neijing states that the kidneys open in the ears, so that superfluous substances of the kidneys are deposited in the ears, making the ears an instrument of diagnosis. Also, the same text states that many channels (Jingluomai/meridians) exit in the ear. In 1980, a double blind experimentally controlled research study at UCLA Pain Management Center department of anesthesiology UCLA School of Medicine conducted a research study by Richard J. Kroeuning M.D., Ph.D and Terry D. Oleson Ph.D. This study reported in the medical journal, PAIN, verified the scientific accuracy of ear diagnosis. There is a statistically significant level of 75% accuracy achieved in diagnosing musculoskeletal pain problems in 40 pain patients. 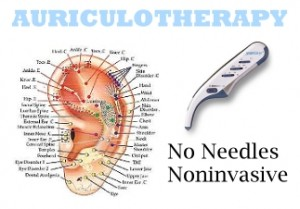 Auricular therapy is successfully used for weight loss, addictions, fertility, hormonal imbalances, pain management, high blood pressure, anxiety, depression, insomnia and more.